Background Both forefoot and hand disease activity are frequent in RA, but DAS28, CDAI, SDAI (composite indices of disease activity) omit the foot joints. However, because forefoot disease activity can lead to joint damage, pain and disability in weight-bearing activities, the control of forefoot disease activity is important. We investigated the association between the prevalence of ultrasonography (US) abnormalities in the forefoot and clinical findings used by ultrasound in patients with RA. Objectives The purpose of our study is to investigate association between assessment of ultrasonography of the metatarsophalangeal joints and disease activity in rheumatoid arthritis. Methods In all, 900 metatarsophalangeal (MTP) joints of 90 patients with RA were examined (22 males, 68 females; mean age: 64.2±11.2 years, range 35–87 years; mean disease duration: 106±74 months, range 5–564 months). US, clinical and laboratory examinations of all patients were performed on the same day. The patients were divided into two groups: the “forefoot synovitis group”, in whom foot synovitis was detected by US, and the “non-forefoot synovitis group”. SJC, TJC, CRP, DAS28-CRP, CDAI and SDAI were compared between these two groups. Prior to US examination, all patients were checked for clinical disease activity (i.e. presence or absence of swelling or tenderness) in the MTP joints and 28-joints by a consultant rheumatologist. Power Doppler examination was performed by the same rheumatologist who is highly experienced with musculoskeletal US. The flow signals in the synovium recorded on power Doppler were classified into 4 grades using a previously described semiquantitative technique (1): grade 0, no flow in the synovium; grade 1, single vessel signals; grade 2, confluent vessel signals in less than half of the area of the synovium; and grade 3, vessel signals in more than half of the area of the synovium. A blood sample was obtained from each patient by withdrawing the blood through a cannula inserted in the vein on the same day as US and clinical assessment. The blood samples were analysed to determine the serum C-reactive protein level. Results Effusion with synovial proliferation was visualized at the MTP joints in 22 of 90 patients (23%). US detected 1.5% subclinical synovitis. The following parameters were significantly higher in the forefoot synovitis group than in the non-forefoot synovitis group: number of swollen joints, number of tender joints, patients' global assessment, evaluators' global assessment, DAS28CRP, CDAI and SDAI (Table 1). 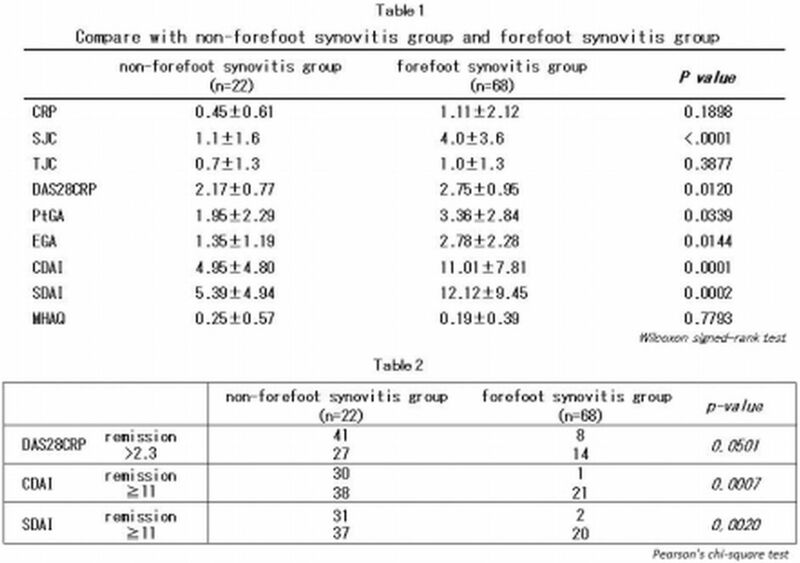 The number of patients who did not achieve CDAI or SDAI remission was significantly higher in the forefoot synovitis group; in addition, patients who achieved CDAI or SDAI remission hardly showed arthritis of the MTP joints (Table 2). Conclusions Forefoot disease activity must be assessed in patients with RA who do not achieve CDAI and SDAI remission. Szkudlarek M, Court-Payen M, Jacobsen S, Klarlund M, Thomsen HS, Østergaard M. Interobserver agreement in ultrasonography of the finger and toe joints in rheumatoid arthritis. Arthritis Rheum. 2003;48(4):955-62.